Scott McKenna is an adventurer. According to the bio provided in the book, "...schooled in the ancient secret arts of ninjutsu, he is the first non-Japanese to survive the rigorous training required of a true ninja. Master of both traditional arts and modern weaponry, following the Bushido code of honor, he is a friend to the death and the deadliest of enemies. An expert in strategy, survival, sabotage, and the swift, silent kill, the Shadow Warrior is the ultimate fighting machine, using body and mind as lethal weapons to strike fearlessly at evil anytime, anywhere ... to deliver justice where even the law cannot go." McKenna is 27 years old as the series starts. For the past 8 years he had been a student at a special Shinto temple in Osaka, undergoing “the most demanding and grueling training on earth”. After he completed his training, he left the temple on good terms with his Master and returned to the States, a country he had not seen in over ten years. Standing 6’2” and weighing 196 pounds, McKenna has hardly an ounce of fat on his well-honed body. Wide in the shoulders with a very thin waist, he has extremely powerful legs and arms taut with muscles but not big. His hair is toast-brown and his eyes are the color of coffee flecked with gold. His interest in the martial arts and in ninjutsu began when his father, a wealthy and influential industrialist, was appointed U.S. Ambassador to Japan when McKenna was in high school. Moving with his family, including an older brother and sister, he fell in love with the training and the discipline and quickly proved over the next three years that he was worthy of further training. Now on his own to do as he wished, thanks to many millions left him by his grandmother, McKenna is able to travel wherever he wishes. It seems, to his consternation, that wherever he goes, trouble pops up and makes him thankful for his unique training and skills. In Hong Kong, McKenna aids an old family friend, a wealthy merchant, who is being forced to let a tong infiltrate his business, having killed his wife and threatened his sons. In Tampa to help a friend and partnet search for sunken treasure, McKenna is targetted by both mob hit men and a Cuban death squad. A street gang has a stranglehold on the south side of Chicago. A secret crime commission has decided their leaders must die and they pick the Shadow Warrior to be their weapon. 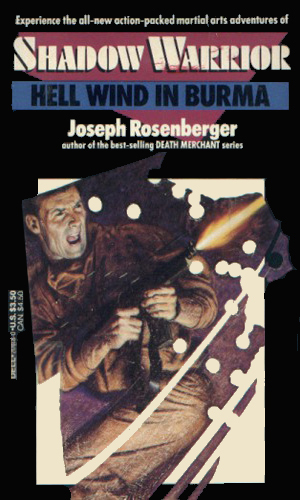 McKenna and two colleagues are sent by their Ninja master into Burma to track down and kill a rival and his band of ninjas who are working for a rebel leader. 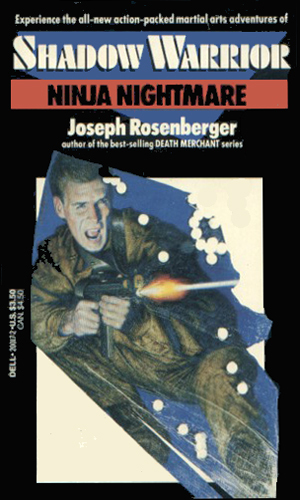 I include the Shadow Warrior in the collection because 3 of his 4 documented adventures deal with foreign governments and take place in other countries. He is by no means a spy but that doesn't stop the action from coming to him. 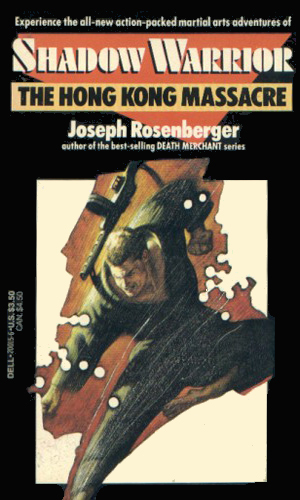 The author, Joseph Rosenberger, is more known for his Death Merchant series. This one came after that one had come to an end. 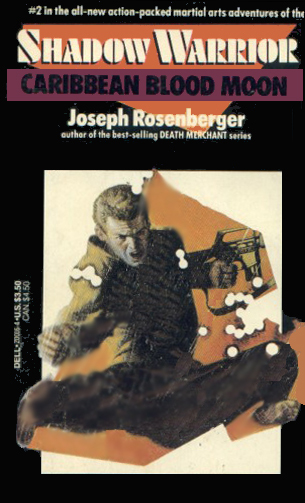 Its style is similar to the Death Merchant but I feel more staccato as though the writer was really not into it. It is not bad but there is not much drawing you back for more.